It’s time for a good old-fashioned murder mystery dressed up in an SF skin, with the twist that the Doctor may actually be the murderer. He’s taking Evelyn for a semi-regular visit to check up on the Galyari, a warlike race he’s encountered in the past who are absolutely terrified of him. It seems they may have good reason to be. This audio takes a while to get going, and I had trouble hearing some lines through alien voice-modulation, but it’s a fun adventure with some original SF ideas (and a certain amount of Applied Phlebotinum). Six proves he can be lovable and a monster. As usual, Evelyn is his best foil. The Clutch, a spacefleet reminiscent of Battlestar Galactica minus the Cylons, is a fine worldbuilding setting that could host an entire TV series covering generations within this multi-species spacefaring society. During the course of the story, we meet just a few of the Clutch’s races: humanoid Star Gypsies, ornithian Galyari, and the furry Mintaru. 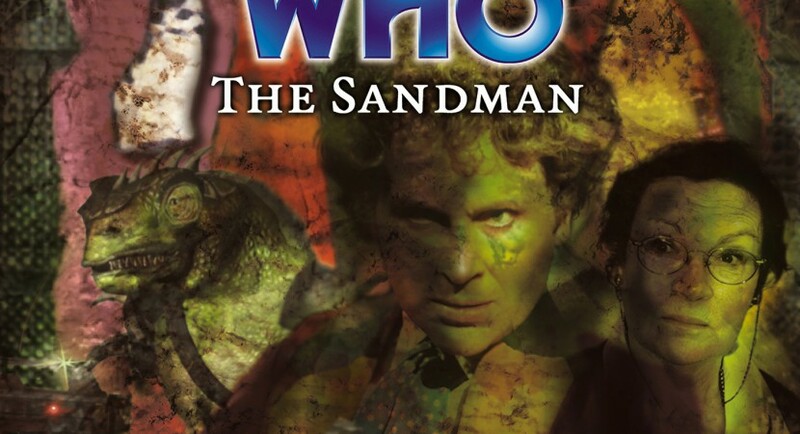 The proud, stodgy, fierce yet fearful race of Galyari, with traits of both chameleons and birds, are a nice addition to the Whoniverse that I’d love to see on TV. Listen closely for Robin Bowerman, Lisa’s older brother, playing roguish Mr. Mordecan, and Anneke Wills under the voice modulator, playing vengeful mother Nrosha. The idea of the Doctor as the monster that haunts and terrifies an entire race is a fascinating twist. Were this a Seven story, it would be no surprise, but ironically, BF has given Six so much humanity since he gave me childhood nightmares strangling Peri that it’s strange to have him behaving like a monster. What’s he up to? Or is he reverting to post-regeneration, faintly evil Six? This audio unfolds at the pace of a good classic Who story, revealing the truth by slow degrees and a few lengthy flashbacks. Colin gets to revert back to his old pompous and faintly terrifying style of Six-acting. What I loved is that now, unlike Twin Dilemma all those years ago, I have an emotional connection to his Doctor, so I had faith in him and was trying to figure out what his bluster was hiding instead of simply being indignant and appalled. The final showdown involves a certain amount of handwaving and exposition, but the acting and characters, setting and soundscape are rich enough that I really didn’t mind. It took me a couple listens to figure out exactly what the Doctor did to defeat Voshkar. Essentially, Voshkar was a golem or zombie, animating the dead husks of his victims. Birds pecking their skins to pieces broke his power, possibly an allusion to the battle of birdlike Garuda vs. snakelike Nagas in Hindu mythology. Director Nrosha also helped by clearing away some of them with her kamikaze attack. The Doctor mentions “his old friend Daphne Du Maurier,” author of The Birds.